Over November, I committed myself to writing a blog post every other day, and although I may have overlooked the fact I have 4 essay deadlines this month, I still want to write as much as possible. A lot of bloggers have ignored what's happening and what has happened over the weekend, but to be honest, I feel like ignoring what's happened is ignoring all the hundreds of people who lost their lives over the weekend, not just in Paris, but in Baghdad and Beirut, and I don't really want to be one of those bloggers who ignores what has happened. Life must continue, but it doesn't mean respect cannot be paid or thoughts and prayers should be suppressed. There are several things I wanted to write and say about the recent attacks, but I didn't think Facebook was the place to do it (out of my own choice- for anyone who has written a status regarding what's happened, I have no opposition to it). Currently I think two things. Firstly, I have seen a lot of posts and tweets about not blaming Muslims, but I haven't actually seen any posts or tweets that do blame Muslims. For the latter, I am completely grateful, maybe it's just the company I keep or the people I follow on Twitter, but if anybody is under any false pretence that a particular religion should be blamed it is vital to understand Islam as a religion is not to blame for this. If you offer a man a gun, 99.9% of the time, he will not accept it, or he will take it and not use it in any way. But there is always that 0.1% chance that he will take it and pull the trigger. The people who commit these acts of terrorism are in that 0.1%. And whilst their God may be who they dedicate themselves to, it is not a God shared by any religion. When attacks in western countries happen, a lot of people jump on their political high horse. No death should ever go unmourned, but it's so important not to eliminate one group of deaths over the priorities of another. The news is extremely bias in western countries, when attacks in the middle east go almost unnoticed, the attacks on France have lead to breaking news reports. 43 people were killed in Beirut yesterday and 18 people were killed at a funeral in Baghdad, both of which got minimal to no coverage. Seeing a status or post on social media stating these facts is a reassurance to me that people aren't ignorant to the bias of the media. 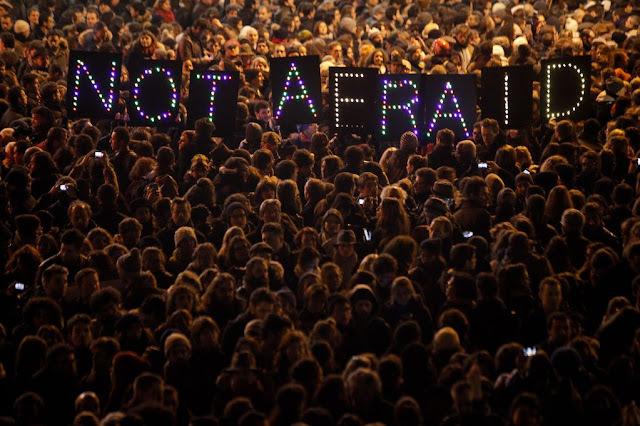 However, when writing about this, it is so important not to eliminate the mourning of those lost in France. IS are an intelligent group and are not to be underestimated. They purposely chose a method of attack which would provoke extreme media attention and result in mass damage. The awful truth is, whilst car bombs cause a moment of sorrow, many of us are unfortunately now immune to such activity and this is one of the reasons the method at which IS went about its attacks was so extreme- it wanted the media attention it received. I am in no way advocating the bias of the news coverage, I'm not ignorant to what happens in the world, I chose to study Politics and International Relations because I'm actively interested in the happenings of the world. But it's important to understand the perspective of the country you reside in when watching the news. To me, one bombing should not be prioritised over another. However, if there were an attack in Belgium, it would be natural for those in Germany to have a strong reaction. If there was an attack in Brazil, there would be endless coverage on the news in Argentina or Columbia. For Britain, France is almost on our doorstep, the reason it gets so much coverage over attacks in the middle east, is because we are a very comfortable society. We are able to pull the wool over our eyes at what is going on across the world because there is nothing concentrated near to us, and not only in terms of vicinity. France is a country with extremely high security, it is an extremely modern state and countries such as Britain, the USA, Australia, are all able to relate far more to the security intrusion of a western state. Many people believe higher security or surveillance to be the answer, but there is no way for the Government to maximise security anymore without inflicting upon our own liberties. This year alone the UK have foiled 6 planned attacks, and on Saturday in Gatwick, that made it a seventh. We are extremely lucky as a country to have not been a successful target since 7/7, but it doesn't mean something won't slip through. However, this is absolutely not a reason to live in fear a man on a whim decided to go into Oxford Street and shoot at anyone and everyone, he could. You could be hit by a car tomorrow. It's all very morbid, but the chance of being caught up in a terror attack is so minimal you have a higher chance of being killed by a bee sting. In times of international terror, people show their true colours, and that has, obviously, lead to a huge Facebook cull on my part. Whilst I'm all for having your own opinion on the matter, anything remotely racist or xenophobic is immediate grounds for deleting. I completely understand people are scared for their wellbeing. But IS don't need to come into a country disguised as refugees. I'm not saying they haven't, but IS have the ability to turn and recruit people in western states through the internet, through media. There are extremists living in western states of all faiths, and not necessarily through being turned by IS but because they have an extremist view. To segregate a whole religion based on one tiny tiny proportion of people makes absolutely no sense. It's important to remember the people these refugees are fleeing from are the same people who attacked Paris. From a more sociological and psychological point of view, the segregation and isolation of Muslims is exactly what IS want. People don't turn to extremists reactions if they're integrated, if they feel welcome and at home. The brothers behind the Charlie Hebdo attack in France were outcasts, and Paris itself is a self confessed hugely segregated city. And it is those who feel out of place which are easy targets for groups such as the IS. By closing borders and targeting all of those who share the Islamic faith, no matter where they're from or who they are, we are making the IS even more powerful. If you have access to read my blog, I can presume you have access to Facebook or your own Facebook account. You only need to log on for 5 minutes this weekend to observe examples of racism, or on the other side of the scale, of people jumping on a bandwagon or sharing a post for likes. I am not against the French flag as a sign of solidarity across Facebook, my own profile picture (after much umming and ahhing) has also got the filter, but it is so sad that it has taken something this close to home to make everyday people comment and take an interest in the goings on in the world. On the one hand, those publishing and writing status' about 'no coverage of Beirut' are rightfully focusing their attention on international events, however for the most part, the focus of this argument being around the media coverage has been misplaced. Of course there is coverage, there are hundreds of thousands of news reports on the events of Lebanon, but the media have prioritised Paris for the reasons I've previously mentioned. The truth is, 99% of the people commenting and posting about the unbalance between attention wouldn't have a clue about the goings on in the international society outside of Europe if it weren't for the attacks in Paris. Although sharing opposition posts is great for countering western power over social media, posting it for likes and feeding off peoples grieving is not the reason to be doing it. The real focus shouldn't be solely on the media. Everyone with half a brain knows the media are bias. You can't rely on any source to give an unbias account. The questions people should be raising is why was there no safety check in for Beirut? Why is there no safety check in for Syria on a daily basis? These are examples of western superiority in the purest form. Prioritising the safety and wellbeing of those in Europe over those further afield is the kind of attention we should be combatting. On the other end of the scale, I've seen status' targeting 'hipsters not changing their profile picture because their too cool' and this is also completely besides the point. Think about what this is about. The foundation, the reason for why everybody has decided to do this. It is not for anybody to target or belittle someone based on a profile picture. An event and response which is meant to unite us in solidarity is causing petty, unnecessary arguments full of people believing they're better than another whichever side they're on. Facebook, on the grander scale, is insignificant, don't lose your way getting caught up in its politics. There is no doubt the last three days could potentially change the world. The international response has been phenomenal in its support, but it is also terrifying. I just wanted to give anyone who is confused or doesn't feel like they have an overall perspective to make up their own mind based on real facts and figures, rather than those found on Facebook and in the Mail Online. Right now our thoughts and prayers should not be isolated to one group, they should be with anyone and everyone who has ever been under threat from another human being. In the aftermath of an attack, it is easy for states to react irrationally (2003 Iraq invasion ring any bells) and personally, I think although there must be a response, it needs to be thought out and carefully planned as opposed to indiscriminate bombing of Syria. This is not a time of segregation, it's a time for every single person to put aside their differences, their faiths, their beliefs, and unite against an international terror. And the truth is, if France respond and call upon Article 5 (please look this up if you are unclear), it could cause international devastation. So pray for Paris, pray for Beirut and Baghdad, but please also pray for humanity as whole, because this is an international situation, and closing borders, jumping on bandwagons and making racist attacks is not going to make it go away.